Publisher: Geoffrey Nevine April 28, 2017 This information is provided solely as a guideline. 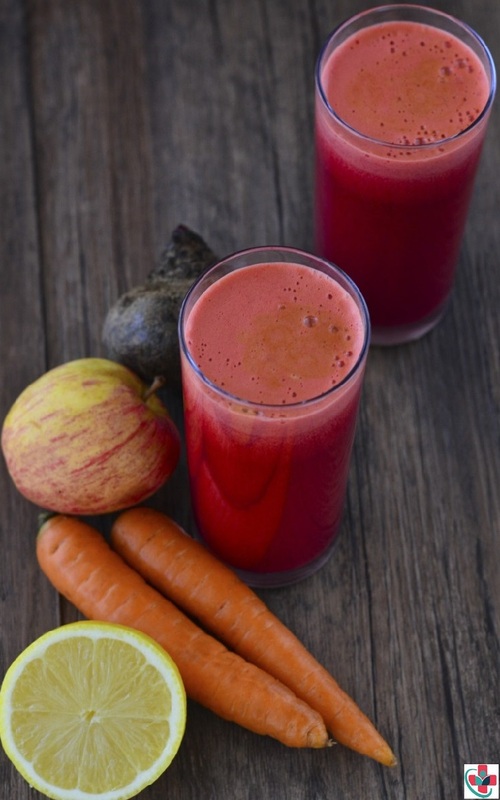 Raw carrot & beet juice is loaded with Vitamin A, C, B₆ and other good stuff. This juice works wonders for your skin and is a great natural pre-workout drink. The combination of carrot, apple, lemon, and ginger emulates a sweet and sour flavor that’s absolutely amazing and super refreshing. Add half a beetroot and you’ve just topped up your juice with more vitamins, nitrates and anti-inflammatory properties. So without further ado let’s juice! ➲6 Medium Carrots: Carrots are packed with vitamin A, which may be great for the hair. “Carrots have a high concentration of vitamin A, which helps promote hair and scalp health,” explains health coach Lori Shemek. ➲4 Gala Apples: Apples are packed with antioxidants and vitamins for overall health. They also contain a compound called Procyanidin B-2, which is known to help new hair grow. ➲¹/₂ A medium lemon: They are often used in detox diets because of their ability to aid in digestion, clean the system, and flush out unwanted toxins from the body. Lemons are high in pectin fiber, which absorbs water and flushes it out of your system, which helps you lose weight. ➲1 Inch Ginger: This potent herb helps improve digestion and gets rid of toxins the gut. A study published in the journal Metabolism shows that ginger helps reduce feelings of hunger, so you eat less and lose weight. ➲¹/₂ Small Beetroot: Beets are great for the blood. They are packed with nitrates, which help open up blood vessels to allow more oxygen to pass through. Nitrates also help lower blood pressure. In cold water wash and scrub the carrots, beetroot, and apples until all the dirt is gone. Wash the lemon and ginger as well then peel the lemon until you’re quite close to the flesh. Add some ice to the juicer jug/glass then pass all the ingredients through the juicer and let the magic happen. Recipe Tip: If you don't have a juicer blend the ingredients with drinking water and sieve it into a bowl. Then pour as desired. Happy Juicing!